There are Troubleshooting sections under the headings on the left hand side, e.g. Under RoboThespian click on Troubleshooting for troubleshooting and resolving issues with RoboThespian. You can also search for a particular component or issue using the search box in the top right of the wiki. If you are unable to resolve the issue using the wiki, we will provide remote support via our online support system. However, after expiry of the warranty period, this service will be chargeable at a rate of £75GBP per hour. We can supply any spare parts required and, in most cases, instructions for part replacement are provided in the wiki. 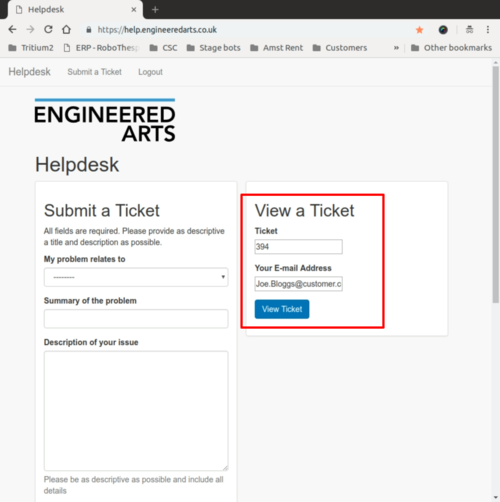 Support requests can be made via the online support ticket system from https://robots.engineeredarts.co.uk/. Please login then click on the Support Tickets link. 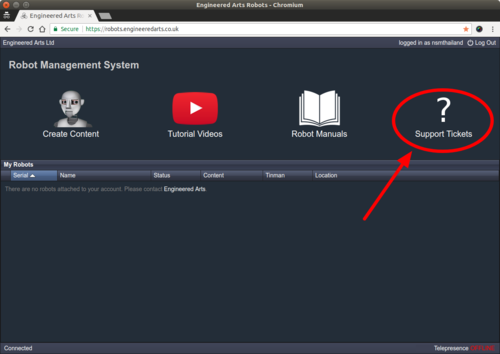 If you do not already have a login please contact Engineered Arts with your robot's Serial Number and we will provide a login. 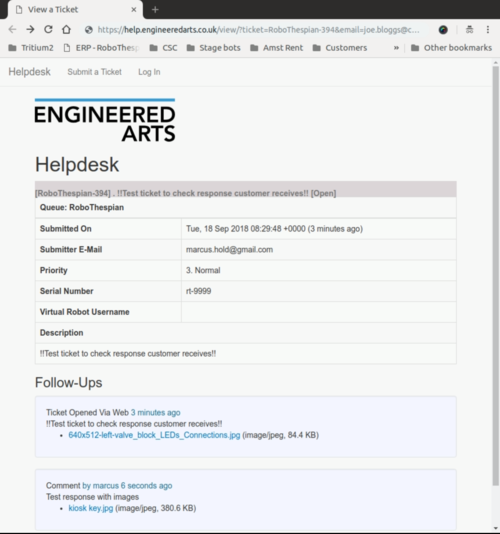 You can report support issues here, attach photos and other files, communicate with an EA engineer and monitor the live status of your ticket at any time. You will receive a confirmation email back. 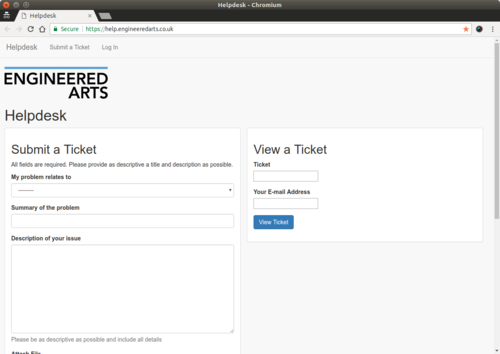 If you need to add any further information or files reply to the ticket email with any files you wish to attach. Please include photos or screenshots wherever possible. Although only one image can be included when opening an issue, you can add more to subsequent comments. Email and telephone requests for support will be re-directed to the online ticket system. As with any technical product, eventually replacement parts and hardware become discontinued and software is superseded. We are continually adding new features, improved hardware and software to our latest robots, and we offer generous exchange deals for customers considering an upgrade to their existing model. We recommend robots over 3 years old are returned to the EA workshop for servicing at a reasonable cost. Please contact us for a quote. We will notify you of any parts that need replacing and of any recommended upgrades available. This page was last modified on 20 February 2019, at 15:57.